Just popping in. I hope you had a blessed Thanksgiving weekend. 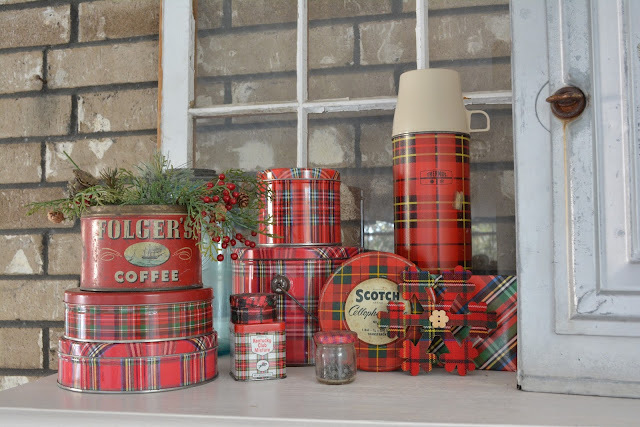 I have had such a fun and creative time decorating for Christmas this year. Our major elements stayed about the same - trees, garlands, and color scheme. This is a little rare for me. Usually, I have a new color every year. I'm still crushing on green and I was thrilled when I saw that Joanna and Target were too. A little black has been sprinkled in this year inspired by their Hearth and Hand line. 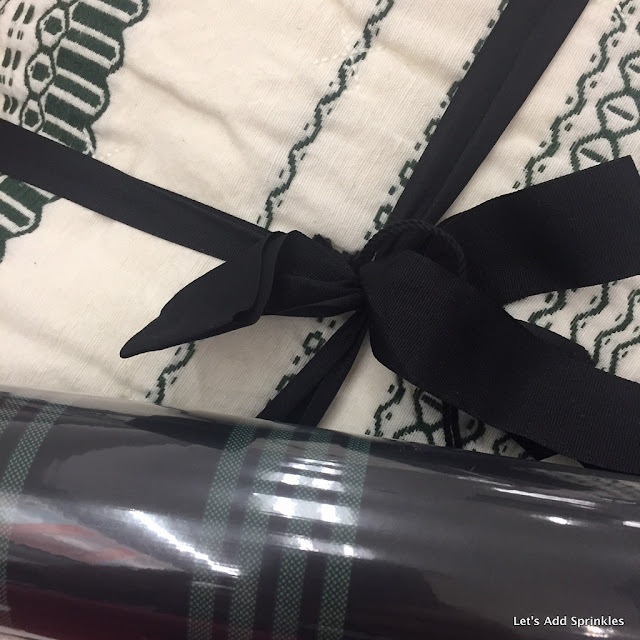 It took me a few days to get to Target for their collaboration with Chip and Joanna Gaines of Magnolia. 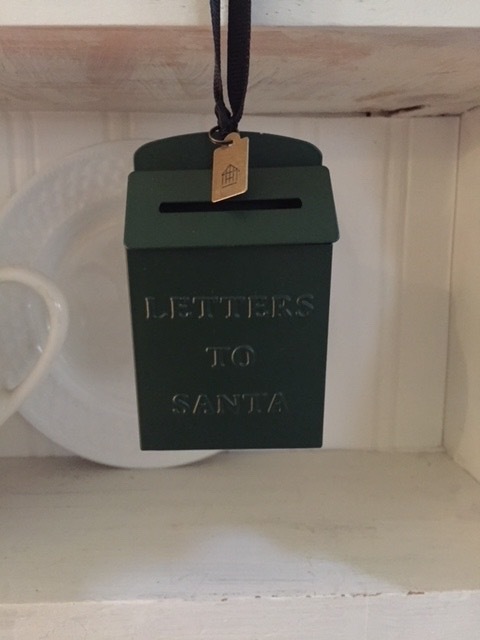 The large Santa mailbox was already sold out but there were two ornament mailboxes left. I snagged both of them. 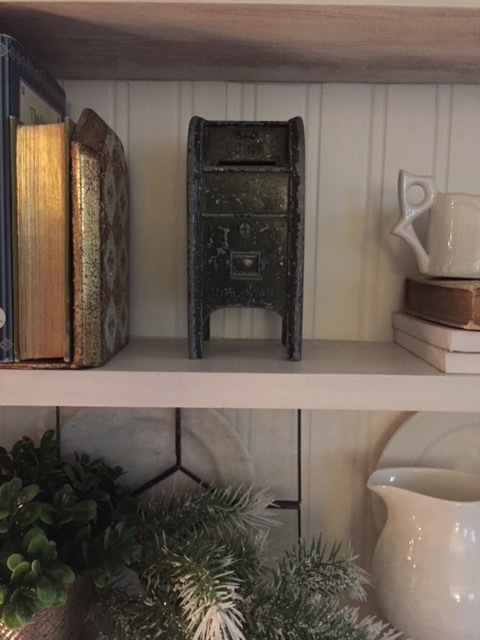 They go perfectly with my antique toy mailbox. Anything mail or mailbox related was commandeered for our decor. An intense brainstorming session prompted a trip to Home Depot for a real mailbox. 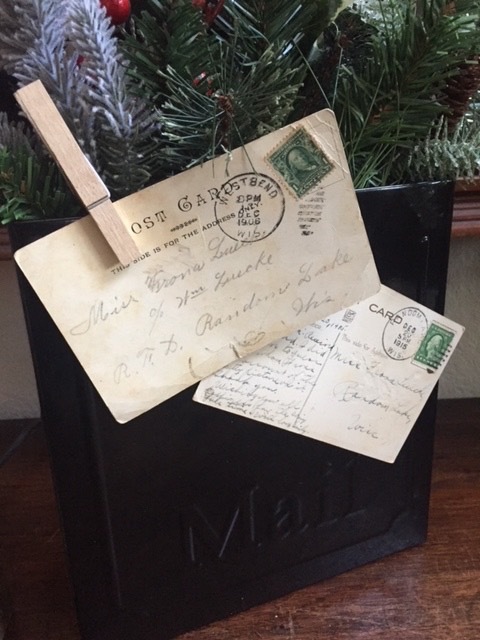 Antique postcards addressed to my grandmother are pinned to the box. Look at the beautiful cursive handwriting. The green stamps are just too perfect. 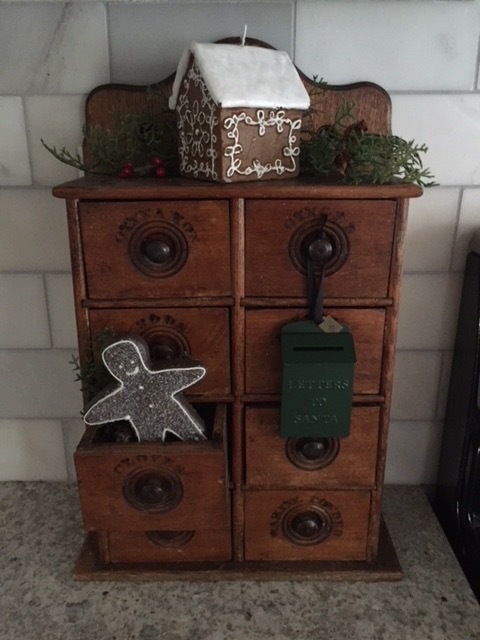 The mailbox is flat on the bottom so it is wonderful as a receptacle for Christmas greens. If you would like to see more of our 2017 holiday decor, please stop by next Monday. 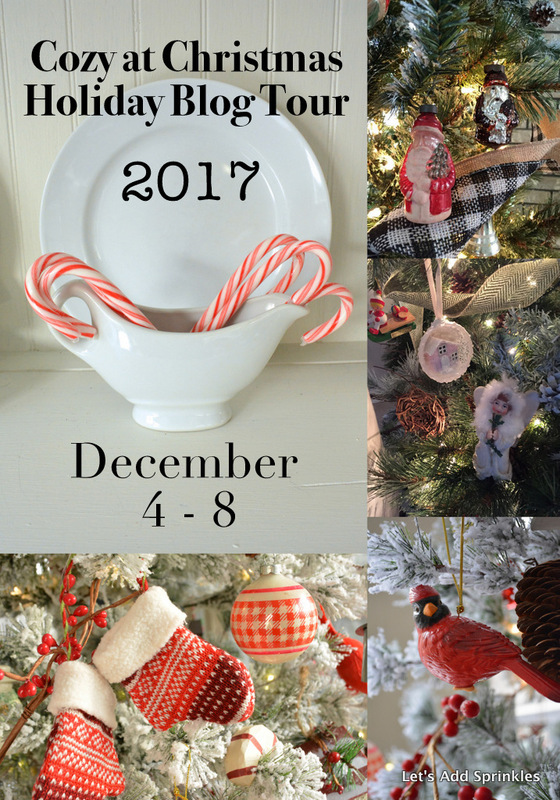 I'll be sharing more as a part of the Cozy At Christmas Blog Tour. There will be four or five different blogs each day next week so there will be loads of holiday inspiration. Here is the list of the blogs on our tour. Its all looking so cute Katie. It is hard to believe the season is upon us already. Have a great new week. 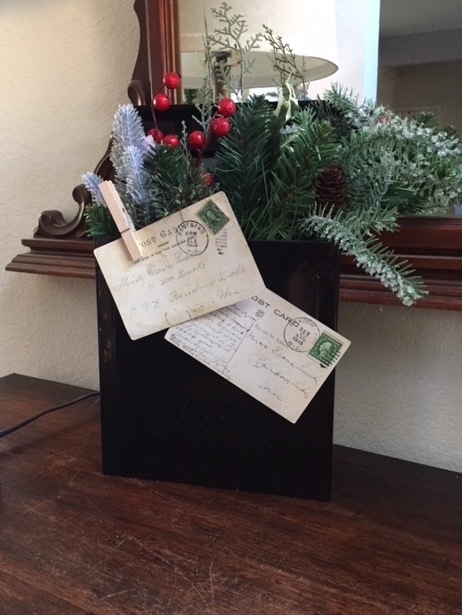 I love how you incorporate your vintage postcards. I do that too. Such a fun time to display them! It's all lovely, Katie! Very festive. It’s all so beautiful and unique! Love it! Thanks Katie for putting the blog tour together again this year. 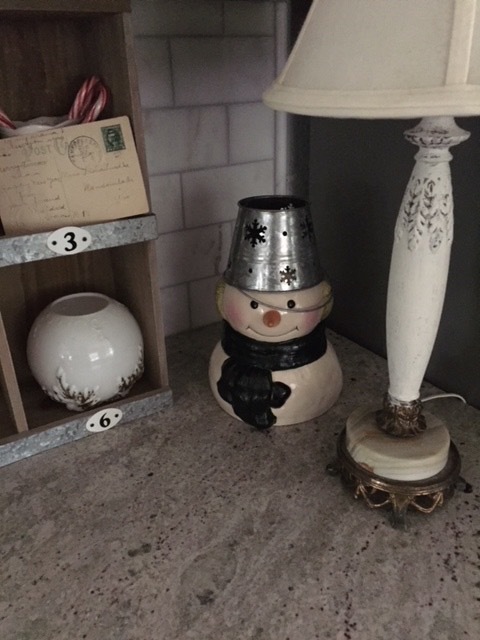 Looking forward to seeing all the great decor next week!